Carowinds received a nice new entrance gate for this season. First ride of the day would be Nighthawk. Nighthawk is a Vekoma Flying Dutchman coaster that is a lot of fun. However dispatch times really stink so it is best to go here first. Flying Ace Aerial Chase is a Vekoma Junior Inverted coaster. It's a good mid-sized coaster. A very underrated coaster - AFTERBURN. I seriously feel this is one of the better B&M inverted coasters out there. It's definitely the second best coaster in the park... we'll get to the best here in a bit. WindSeekers have quickly become a guilty-pleasure ride for me. I love them. Thunder Road is the park's racing wooden coaster. I've heard it might be torn out soon, so I gave it a courtesy ride. Goldrusher is the park's minetrain. It's a fast little ride. Ricochet is the park's mouse coaster. Carolina Cyclone is the park's Arrow built looper. I like the corkscrews over the midway. Hurler is the park's other wooden coaster. The smoothest part of the whole course is the first drop. Vortex is the park's B&M stand-up coaster. It is honestly not that much fun. The layout is unimaginative and there is a lot of head banging. This is Intimidator - the park's B&M hypercoaster. It really towers over this side of the park. It is quite enjoyable and has some moments of great airtime. It features the flying-V style of seating arrangement. As good as Intimidator is, it is no match for the new FURY. FURY is a B&M built giga-coaster. FURY is all about speed. There are a couple of aggressive airtime hills along the layout. It interacts with the walkways leading to the front gate. You definitely want to hold on tight while riding. The "treble clef" element on the ride. This ride is close to perfection. It never lets up the entire course. 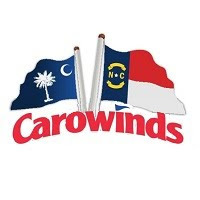 Thanks for a great day, Carowinds.